Mesh networks and ubiquitous mobile connections deliver the automated highways to improve safety, increase capacity and reduce congestion. The intelligent highway is a term used by many in the automotive industry and government bodies to describe a world where cars don’t crash, congestion does not occur and there are no accidents; a world where cars automatically detect a problem ahead and avoid it through either slowing down or taking alternative routes. 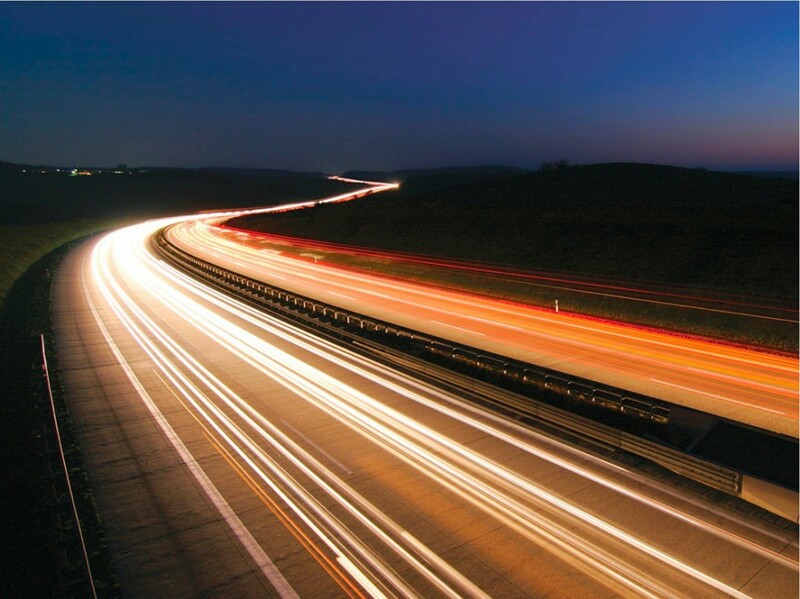 Intelligent highways, when they arrive, will significantly reduce the number of deaths on the road and make travel smoother and faster, which will also mean that we use less energy for mobility. This ambition of the transport professionals has been much discussed and has been the focus for numerous programmes over the years, but these efforts have only led to many false starts. However, in the opinion of many commentators, realisation of the intelligent highways concept is on the horizon. With forthcoming regulation, technology deployment and cooperation between manufacturers, they look set to be part of our world by 2020. At the extreme, intelligent highways enable the introduction of the driverless car – an autonomous vehicle that drives itself from point A to B, selecting the best route, avoiding congestion and choosing the speed and distance from other vehicles to ensure that there are no accidents. This is what you see played out in science fiction movies from Batman and Total Recall to I, Robot and Minority Report. Over past decades, there have been numerous research programmes focused on this goal, including the ARGO project in Italy, the FROG project in The Netherlands, the DARPA Grand Challenge in the US and, most notably for the media, the 1997 San Diego Automated Highway demonstration in which a number of driverless cars followed each other down a 12 km test track. In 1995, on the open road, a Mercedes Benz drove from Munich to Copenhagen and back using saccadic computer vision and achieved speeds of over 175 km/h over distances of up to 150 km with no human intervention; the ARGO project used stereoscopic vision algorithms to follow the white lines in the road for 2,000 km, with the car in fully automatic mode over 90% of the time; and, after previous competitions in the desert, in the 2007 DARPA Grand Challenge, a team from Carnegie Mellon University won the prize for a car that autonomously navigated through an urban environment. In 2008, GM announced that it would start testing driverless cars by 2015 ahead of launching in 2018. In Europe, autonomous vehicle demonstrators are being built in several locations including Rome, Vienna, Trondheim and Heathrow Airport. At the next step down from fully autonomous vehicles, assisted driving is increasingly common in cars of today. Adding to the long-standing cruise control capability, manufacturers have variously introduced lane departure warning systems, anti-lock braking, traction control, night vision, rear view alarms and automatic parking. Additional developments such as automatic emergency braking, intelligent speed adaptation and predictive cruise control are also on the horizon. All of these technologies help the driver to control the car more efficiently and so are proven ingredients for the overall intelligent highways ambition. As Volvo, one of the leaders in automotive safety over the years, puts it: ‘In principle, a future Volvo will be able to “speak” to an oncoming vehicle, potentially communicating: You and I are about to collide head-on. If our drivers don’t react, we have to do something to avoid the danger.’ A stated company aim is that ‘by 2020 no one will be killed or maimed in a Volvo’. There is, however, a missing link, namely, the integrated systems needed to allow cars to communicate seamlessly with each other and the ecosystem through which they are moving. This is the key network that will allow interaction between the moving and fixed nodes (ie, vehicles and traffic signals etc). While some of the initial experiments focused on embedding sensors into and alongside the roads, thinking has quickly evolved to take advantage of GPS and 3G/4G mobile systems. With vehicle infrastructure integration, as some are calling it, standard wireless protocols will allow cars to communicate with each other and with traffic signals; at the same time, government agencies, car manufacturers and traffic control systems will be able to communicate directly with every vehicle. In the US, there has been significant focus on intelligent highways as a means to reduce the 42,000 traffic fatalities that occur every year as well as the $230 billion of losses from wasted fuel, emergency response costs, 6.3 million insurance claims and medical bills. Aiming at connecting 150 million vehicles to the internet, companies such as Google, Cisco and Microsoft have all announced plans for advanced transportation communication networks. In the UK and Canada, Aviva, the insurance company, launched a product that paves the way for consumer acceptance of some of the key technologies: The ‘Pay-As-You-Drive’ insurance system. This uses standard mobile SIM cards within cars to allow them to be tracked continuously. The upside for customers was cheaper insurance depending on where and when they drive. The system also proved that, on a large scale, vehicle tracking is already fully practical. This type of technology is being implemented in Europe over the next couple of years under the eCall in-vehicle programme for emergency assistance, but also allows other options such as road pricing without toll-booths to come into place. Other systems use radio frequency (RF) tags to communicate with and between cars (Zipcar uses this system to allow people access to its car-sharing services). Meanwhile, countries like Singapore, which were early adopters of road pricing, are now looking at wider GPS-based systems. Together, these innovations not only enable safer driving but are also the gateway to a wider shift in the currency of travel. Some Bangalore workshop participants contended that new payment mechanisms – where fuel, insurance, vehicle use and travel overall are charged by distance – are already operable within a short timescale. While Western economies to date have invested most in the concept and testing of intelligent highways, several workshop participants felt that the breakthrough in terms of implementation of a viable, scalable system may first occur in India. With companies like Tata having a significant interest in both the automotive industry and the ITC sector, it is possible that a partnership between Tata Motors and Tata Consulting could be the catalyst for a mesh network approach to greater assisted-driving and eventually the intelligent highway. With many different systems in development around the world, a critical issue for widespread implementation will be the adoption of a common platform. A recent comment by Booz & Co highlighted that, ‘from a policy perspective, there is little question but that an open standards approach, which would allow all to use the same technology, would be best’. Ford has already taken a step towards this by adopting an in-car WiFi system turning the entire car into a hot spot – which, in the words of a workshop participant from the communications sector, ‘paves the way for the car to be the fourth space for mobile connection’. For the mesh networks that many see as being the foundation for the next generation of intelligent highway design to deliver the goods, all cars, traffic signals and integrated infrastructure have to use the same system to enable fast and free transfer of data. Just like the internet itself, no one will own this system-wide network but everyone’s and everything’s participation will make it work. The other big hurdle is social acceptance of intelligent highways and, by implication, autonomous vehicles. The UK government, for example, sees that, while much of the technology and systems are available and proven, it will be 2015 before many of the legal and consumer issues are agreed: trusting the system rather than the driver to control the car is no easy step. As Markus Armbrust, manager of advanced driver assistance at GM, was quoted as saying: ‘Drivers will not want to give up all the fun’. Equally BMW want to continue to provide the ‘ultimate driving experience’. Many, however, are confident that once the benefits of safer, quicker travel are evident, for the majority of drivers, the option of joining a smooth intelligent highway system rather than the usual nose-to-tail commute will become increasingly attractive. There are clearly a number of outstanding issues to be dealt with but, given the impetus and the number of vehicles being added to the global infrastructure every day, the world in 2020 could well see us travelling on intelligent highways.